Who Will Write About Paris? VMP Announces the Contributors to Anthology "That's Paris"
So who will be writing about Paris? 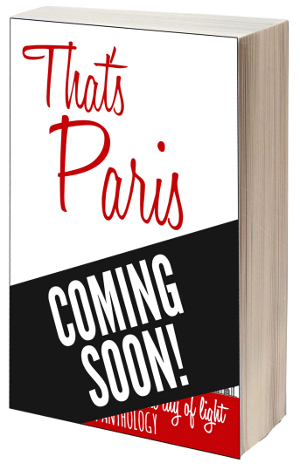 Velvet Morning Press is pleased to announce the list of writers contributing to our first anthology, "That's Paris." A few clues... We have the author of three fashion books, the writer of a recently released book on Rwanda, an Amazon best-selling author, journalists, a personal chef and winners of various blogging awards. For details, check out the full author list. Not only are our writers talented, but they also are generous. Author proceeds from anthology sales will be donated to Room to Read, a charity that partners with communities in the developing world to promote literacy and gender equality in education. If you've ever traveled to Paris, lived in the City of Light, or dreamed of setting foot on its cobblestoned streets, "That's Paris" is for you. From culinary treats (and disasters) to swoon-worthy romantic encounters (and heart-breaking mishaps), this collection of stories takes you on a journey through one of the most famous cites in the world. Slated for release February 2, 2015. VMP is a dynamic, indie publishing house run by authors Adria J. Cimino and Vicki Lesage. Founded in 2014, this small press aims to discover new writers as well as publish established authors in its anthology collections and other special projects. Do you consider yourself a book-lover? Not just someone who likes books. Someone who talks about books, thinks about books, and of course spends most of their free time reading about books. Someone who loves books. Does that sound like you? Well how would you like to write about books? To give our readers a little diversity, we're looking for guest posters to write about--you guessed it--books. We have a few ideas for columns (top 10 lists, outfits/gifts/recipes inspired by books, etc.) and we are open to your ideas as well. 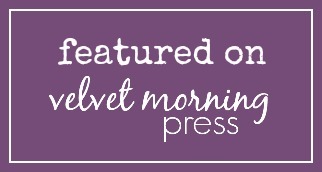 If you'd like to be published on our site, please email us at contact@velvetmorningpress.com with either your idea for an article or a finished, previously unpublished article that you think our readers will love. If accepted, your article will include a bio with links back to your website and social media and you will have the possibility of becoming an ongoing contributor. It’s you against the clock. Your mission: Write a 50,000-word novel by the end of the month. Will you be victorious if you make it to the end with a couple hundred pages under your arm? It depends on your long-term goals. If you’re signing up because this sounds like a fun challenge and you have always dreamed of writing, then focus on those rules, write as much as possible and sprint toward the finish line! 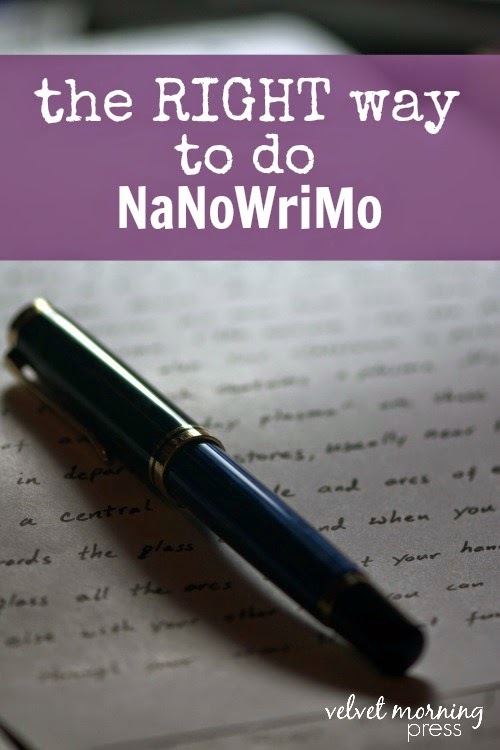 So how can a writer get the most out of National Novel Writing Month? DON’T be obsessed by word count. Put quality before quantity. Everyone is different, of course. But in my personal experience and experience working with other writers, an obsession with word count combined with a tight deadline often equals that big enemy: writer’s block! 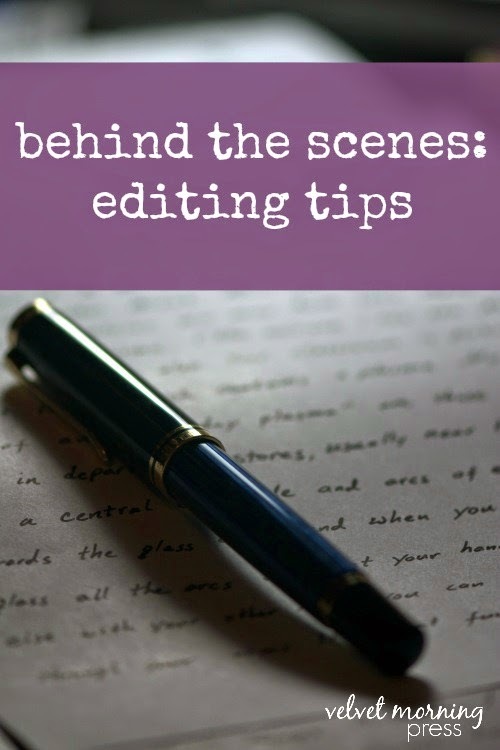 If you write a few pages of promising material that will eventually result in a quality short story or full-length novel, you will be much better off than if you produce thousands of words that fall flat. DON’T think you must write the next Great American Novel and that it will be published by a major publishing house. I’m not saying this to be pessimistic, but to free you of unnecessary pressure. This should be a first step. Chances are, anything you produce in a short period of time will benefit greatly if you set it aside and return to it months later. In most cases, very experienced and established writers take years to produce a novel – so you’re in good company! DON’T compare yourself to others. Sure, more than 300,000 people met the challenge last year. Hmm, maybe I shouldn’t even be telling you that. After all, it isn’t important. Whether one person or one million people produce the target word count, it won’t bring you any closer to or farther from publication. Writing isn’t a team sport, but an individual activity. Compete against yourself. Strive to become a better writer than you were a few years ago. Aim to produce your best and forget about everyone else. DO focus on what you love: writing! This is probably the best reason to sign up for the challenge. And this really applies to anyone who participates: career writers and those who view it as a hobby. We all love to write or we wouldn’t be here writing on/reading the Velvet Morning Press blog. So participating in the novel writing month should make us happy. If it doesn’t: Stop, take a break and return only when the inspiration resurfaces! DO set aside regular writing time for yourself. Like most of you, I have to juggle writing with various other activities/work. Another great thing about National Novel Writing Month is it encourages us to set aside regular writing time. My advice is: Find a time of day or night that works best for you, commit to it and use this month to get into a routine. Ideally, you can continue this routine – or at least part of it – once the challenge is over. I have to admit, as someone who takes months and even years to write a novel, I used to sneer at National Novel Writing Month. But my attitude has changed. I realize that there is something in the event for everyone who loves writing. In my opinion, if you truly want to build a career as an author, you will win the novel writing month challenge if you grow as a writer. And that has nothing to do with word count.